Welcome to the RobotCub Summer School! The RobotCub Summer School, "Veni Vidi Vici", serves to consolidate and disseminate skills in software engineering for humanoid robots. This year it is held in Genoa, Italy, 16-26 July, 2007. Registration is now closed. The RobotCub Summer School, "Veni Vidi Vici", serves to consolidate and disseminate skills in software engineering for humanoid robots. Our goal is to foster long-lived academic collaboration on robot software across the boundaries and lifetimes of individual projects. The school is hosted by the RobotCub consortium, a collection of institutions working towards an open platform for humanoid research. This year's school is organized as a "code sprint" to pull together all the software needed to make a humanoid work -- control and perception algorithms for its head, hand, arm, legs, and full body. This year, the school will be a peer-to-peer event. There will be no lectures, no strict division of instructors and students. All participants are expected to be competent C/C++ programmers with an interest in working with others like them. The school schedule will be organized flexibly around informal tutorials from participants on modules they are working on or interested in. These tutorial will certainly be given by the RobotCub members who will participate, but we encourage everyone to do this. The bulk of our time will be spent working together to integrate modules and implement interesting behaviors for the robot. The school is structured as a series of hands-on practical laboratory sessions, and informal talks. 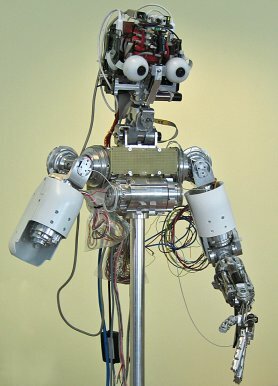 There will be real robots to work with (at least two heads, and one hand/arm/head humanoid). We will have a dedicated local network, including wireless. Participants are expected to bring their own laptop. The theme this year is reaching and grasping. The days will be full. The school will be held in the newly-formed headquarters of the Italian Institute of Technology, near Genoa, Italy. The resources of this institute, covering a range of humanoid technologies, will be available to students. We start at 9:30am, and continue to 7pm (breaks: morning coffee, lunch, afternoon tea). We begin the school in the morning of Monday, July 16 2007, and finish in the evening of Wednesday, July 25 2007 (with people leaving during Thursday, July 26 2007). Sunday the 22nd will be free.